This beach is granted the reputation of being the largest sandy beach in the entire territory. It is a family-friendly beach that also offers a range of activities such as windsurfing, canoeing, kite surfing, water skiing, and others. The beach is divided into three sections – the rocky part, the calmer side, and the livelier portion. There are no underwater currents out here, so it is generally safe for children. Located in a more secluded location, this beach set in a natural cove is perfect for snorkelling and diving. During the weekend, parties are held almost everywhere. While this isn’t the best family beach destination, it is highly recommended for couples and group travellers. The shallow waters are what make this beach quite popular among locals and tourists. The picturesque beauty of this beach seems to have come out of a postcard. Its crystal blue waters never cease to impress. Snorkelling is a favorite activity here, as there are many colorful fish in the area. However, boats are not allowed here, only bathers. Come early in the morning as it can get really busy throughout the day. This beach is quite popular among tourists because of the presence of hotels, restaurants, and transport stops. But although the waters are beautiful, the underwater currents can be really strong out here. If you are an inexperienced swimmer, don’t go out too far. And look after the children. Just content yourself frolicking in the shallow waters or just sunbathe in the beach. The name of this beach means Red Beach in Maltese, and pretty much tells what it’s all about. Gozo’s largest sandy beach offers spectacular scenery, along with great snorkelling opportunities. Since the sea is spotted with rocks of all sizes, pay attention to where you step. The famous Calypso Cave can be found on the western side of the beach, high on the cliffs. Hi everyone, I am heading to Malta in October and will be traveling with 2 kids, aged 5 and 8. Can anyone recommend a peaceful yet safe beach that’s easily accessible from Valletta? I don’t mind using the bus, as long as the route is well serviced throughout the day. Thanks in advance! Paradise Bay is amazing. Cirkewwa in general is a great place for diving with underwater caves, cliffs, tunnels etc. Love it. There are some pretty good hotels in the Paradise Bay area, too. If you’re traveling with kids, I would advice avoiding Golden Beach. Although it’s gorgeous, it isn’t the safest place to take your offspring to. I’ve been on plenty of Mediterranean islands before my trip to Malta, and although the “beaches” provide some delight to the eye and camera, I cannot even compare them to the most gorgeous ones I’ve come across. My absolute favorites are located in Greece, especially Lefkas has amazing beaches. Maltas beaches tend to be rather small and crowded, or then too rocky for my taste. I personally fell over the heels with Gozo’s Ramla l-Hamra beach. The reddish sand was so soft, and sea clean and safe. I also liked the bright white statue of Our Lady in the middle of the beach, which is supposedly there to protect all of us who spend time in this protected beach. Since the beach has Natura 2000 status, you can understand that many of the plant and animal species around are protected as well. Make sure don’t litter it! Beaches of Malta provide food for the eye and one’s camera, but cannot be compared with the great sandy stretches of most Mediterranean holiday islands. 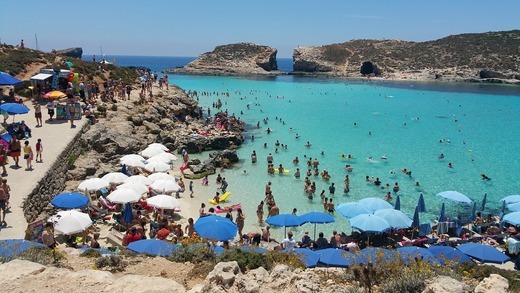 During the summer high season they tend to be really crowded, due to their relatively small size, so beach life should not be the focus of those choosing Malta for their destination.